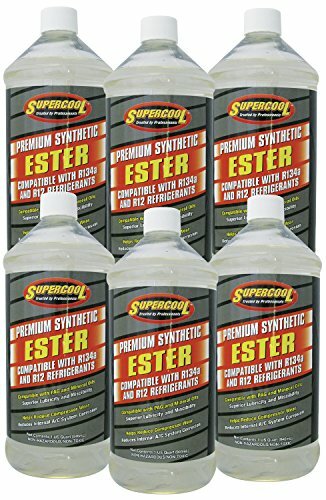 TSI Supercool E31 Ester Oil - 32-Ounces - Case of 6 is a synthetic ester lubricant that provides excellent lubricity and compressor protection. It includes additives to prevent acid formulation and corrosion. This oil features O-ring conditioner, anti-wear and anti-oxidant additives. It is compatible with PAG and mineral oils, as well as with R134a and R12 refrigerant. Supercool customers receive industry's leading technology in all fluids with lubricants and UV dye's formulated to meet or exceed OEM performance specifications. In addition, all lubricants are top-off compatible with their corresponding OEM and aftermarket equivalents. Designed for real-world operating conditions, they provide an unsurpassed level of service, performance, protection, and fluid life.